The history of the farm. she can get awarded to the first, and that's it. We began to develop the structure and mood. To meet international standards. The results of the dog show, we have many dogs as Thailand Champion. Our reputation is growing. The foreigners were also interested in the dogs that come from our farms and order from our farms to feed the dog in many foreign countries such as Amarica, Netherlands, Germany, Taiwan, Vietnam and Laos etc. And the work that we are most proud, we have Thai Ridgebackdog male red colour, name "Th.Grand Ch.Tawan Namfah Daeng-Pluang @ Saim". 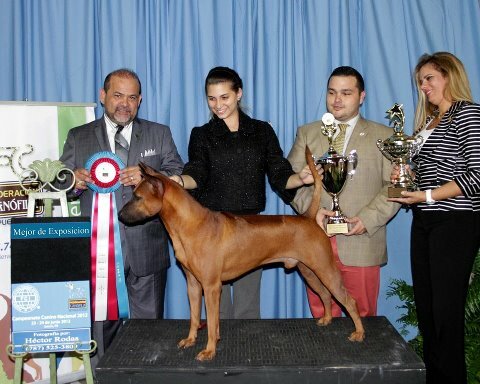 Dog has won several Best In Show (TOP DOG 2009) is an honor for Thai Ridgeback dogs. "Tawan Andaman Phuket Kennel" since 2008.
foreigners to purchase from us and are exhibited in the United States. He could win Best In Show in the United States. Dog's name. Mult.Ch. Tawan Namfah TRD Sira-Nakorn. It's very exciting. Thai Ridgeback dog to build our reputation abroad. To foreigners known as the national dog more. From the dog show the winner will be awarded for life. So very tired. However, we will not stop to this development only. We will continue to develop ever better and further. Ultimate hope is that we wanted to have a Thai Ridgebackdog World Championship to occur in Thailand. And invited the Thai Ridgebackdog from abroad. To publicize Thai Ridgebackdog that is known and published throughout the world. In most of Labrador, we brougth labrador male black colour named "BOBO" from Dog Area. And make Thailand Champion for him. After that we have imported Labrador female, her name is "Greatlands Blackstar" from Australia is the Driftway where her father was a dog, number one of Australia. Waiting for further development. We exchange ideas with everyone. To help them develop Thai Ridgebackdog, Labrador to get even better.